One of the biggest advantages that computer based Mind Mapping and brainstorming have over their hand drawn counterparts is the ability to insert items. In iMindMap Ultimate, you can pretty much insert anything, from images and icons to web links and audio notes. Combined, these all work together to turn your work into a large resource hub on one screen, without compromising its brevity. You can obtain all of your information in one accessible place. 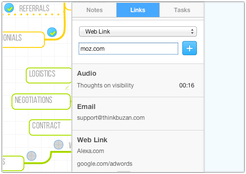 Insert text notes on your branches in Mind Map View, sticky notes in Brainstorm View and bubbles in Fast Capture View, to add more detail to your creations. Notes remain hidden until clicked on, to keep your workspace uncluttered. You can even copy and paste whole pages of text from the internet without having to worry about spoiling the concision of your work. Creating a presentation? Adding notes to your branches in Mind Map View will automatically convert into slide notes when you switch to Presentation View. Record and upload multiple audio notes to your branches, sticky notes or bubbles. 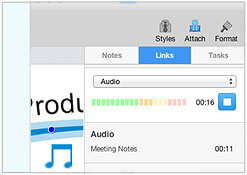 Audio notes are perfect for recording chunks of information quickly in meetings or classes. It’s a fact that images are processed instantly by the brain. They have the power to convey much more information than words and act as visual stimuli to make recalling information much easier. 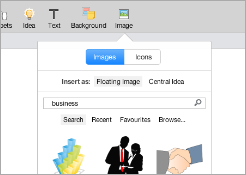 You can search for images in iMindMap’s extensive library, or even upload your own images from your computer or insert from the web. You have full flexibility with your images; they can be floating on your Brainstorm and Mind Map view canvasses, neat and tidy in a box branch or even used as central ideas. Icons are a great way of visually categorising and organising the information on your Mind Maps and brainstorms. You can number branches, bubbles and sticky notes, flag important details and even filter information using icons when developing ideas in the Mind Map View. To filter information on your Mind Maps by icon, go to ‘View’, select ‘Filter’ and choose the icon you want to show. Any branches that the icon appears on will appear. The ability to attach links, including documents, web URLs, presentations, PDFs and even other Mind Maps to your creations allows you to consolidate large volumes of information on one easily accessible workspace. Like notes, links can be attached to your Mind Maps, bubbles and sticky notes without disrupting their order. In Mind Map View, you can simply drag and drop web links or important files onto your branches to create one big epicentre of resources. Your attachments appear as link icons that open when clicked. Hint: To send Mind Maps that contain multiple images, files and links to another computer or to share them with friends or colleagues, you can export them to a Pack & Go file. A Pack & Go file will compress your Mind Maps for easier and faster sharing, so your iMindMap contacts can view your maps and the attached resources. Appearing as a cloud around selected areas of your Mind Maps in the Mind Map View, boundaries offer a creative way to highlight certain areas of your Mind Maps and group relevant information together. It’s yet another ingenious way to organise your Mind Maps and visually represent information in iMindMap. While Mind Mapping, you might decide that the idea you are adding should have a Mind Map of its own. 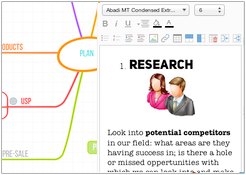 Luckily, you can create multiple Mind Maps on the Mind Map View’s limitless canvas using the MultiMaps feature. In a few clicks, you can add another central idea to your canvas and instantly start creating a new Mind Map. Creating MultiMaps allows you to explore the specifics of an idea, without interrupting your trail of thought so that ideas can continue to flow. 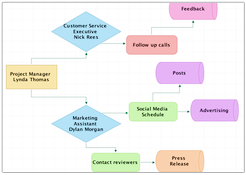 Flowcharts can be used to highlight the relations between topics and to identify how they impact one another. Flowcharts can be used in conjunction with Mind Maps in Mind Map View. First create a Mind Map, which will provide you with a visual overview of a topic, and then create a flowchart alongside your map to drill down into the specifics of the topic. To find out more about flowcharts, please visit this blog post. 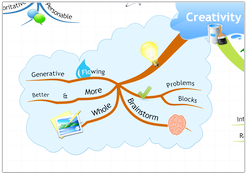 There’s no bigger creativity killer than clutter, which is why iMindMap Ultimate is designed to encourage simplicity. The ability to insert the above items allows you to flesh out your Fast Capture, Brainstorm and Mind Map View creations and break down complex information into easily manageable chunks, without the clutter. The additional details remain under the surface, so you can think clearly and freely. To learn how to use the insert feature, please visit our help guides here.